Re-balancing and pores purifying cleanser. This unique smooth whipped soufflé cleanser with Shunly Skin Care’s FUSION FORMULA® featuring Camphor, Clove Oil and five herbal extracts plays an indispensable role in removing excess sebum in oily and blemished skin. This deep pore cleanser with decongestive and anti-irritation activity removes skin surface dead cells, impurities and pores blockage. It promotes clear and smooth complexion and PREVENTS (as part of 3 SkinCareActs™) skin from pore clogs. Use twice a day by massaging onto the skin and building lather with a small amount of water. 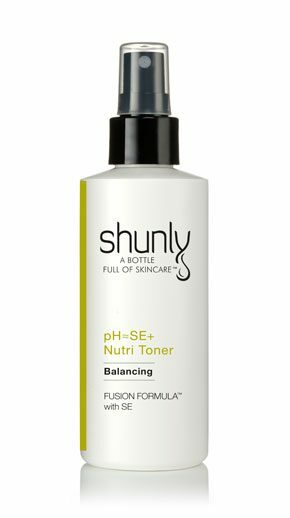 Rinse thoroughly and follow with Shunly pH-Balance Toner. Can be used as a luxurious facial shaving cream by men. Aloe Vera Gel, Stearic Acid, Hydrogenated Polyisobutene, Herb Extracts:(Ivy, Watercress, Lime Tree, Lavender, Soapwort), Cetyl Alcohol, Dimethicone Copolyol, Triethanolamine, Lauro Ampho Carboxy Glycinate, Sodium Trideceth Sulfate, Camphor, Clove Oil, Phenoxyethanol, Potassium Sorbate, Sodium Benzoate. money put into the facial cleansers from common pharmacy stores like CVS or Walgreens. in order to keep my skin fresh and dry-free. it! It leaves my skin feeling clean but not dried out. I also really like the texture of the wash.
oily through out the day. I’m looking forward to the continue use of this product! My daughter is suffering from active acne, and we decided to give this line a try. has been using it for 2 weeks now, and both she and the family can see a huge difference. I use the CC+ Oil Control Whipped Cleanser at night. I love how creamy the whipped cleanser is without leaving a feeling of residue on my face like other skin care lines I have tried. The CC+ cleanser is deep cleansing and removes all of my makeup (including mascara….yay!!!) without irritating my eyes or drying out my skin. I am currently using this along with one of Shunly’s gentler cleansers for my morning routine. I love how great my skin looks and feels from these products! I love this cleanser. It is lightweight and really easy to use. I was really surprised by how little I had to use. Maybe a pea size amount. It rinses clean and leaves no residue. My face didn’t feel tight at all which way awesome. I love this cleanser! The best I’ve ever used hands down! I have very oily skin, this is the holy grail! I also wear very heave, full coverage makeup. This cleanser cuts through everything with no problem. I love the smell, I love the texture I love the results! My skin has never felt so clean! It took me almost 1.5 yrs to get through my first cleanser!!! I use this in the morning, to prevent oil production throughout the day, and use another cleanser at night. Due to the longevity of this product, I used a spatula to scrape out a small amount and prevent me from repeatedly having wet fingers in the container. I have never had a more satisfying “clean” feel after washing my face. I love this product so much! Ever since adolescence I have struggled with my skin. I have oily skin and have battled with finding ways to keep my skin looking healthy and vibrant. I have tried everything. I have used many of the well known, high priced department store facial skincare products including moisturizers and lotions. Nothing has ever made me feel like my skin was okay until now. My pores have minimized. My skin does not feel shiny. I am so glad I found out about these wonderful products by Shunly Skincare. I highly recommended!!! I have been using this product for 3 months now.. It gets my skin clean without drying it out. I highly recommend using the Shunly products for your skincare. I am a teenager, and had suffered with acne for a very long time. We went to doctors, dermatologists and specialists…but no reccomendadtions worked. Now my skin is almost 100% clear. My face feels so refreshed after using this. It also feels soothing when massaging the cleanser on my face. Whenever my family visits me, they noticed the improvement on my skin’s appearance. I have had oily skin since I was a teenager, but more than that, I have had challenging skin: blackheads, dry cheeks, and enlarged pores on my nose. With consistent use, I have seen a noticeable improvement in all of these problem areas! This has been an excellent product to use to take care of my skin for the long term. I got really bad acne last year and have been using this since, and no acne! It’s become a necessary part of my skincare routine.